Oh, looking very abstract indeed. No, it's not an upcoming movie. A new article has been published on the Windows Experience Blog, which details something special that Microsoft has planned for New York. With the imminent release of both Windows 8 and Window Phone 8, as well as Xbox, Office and other product goodness, the company is going social. Literally. The Microsoft team has created a stylised one hundred and sixty foot version of New York City in an art installation, named Microtropolis. It's stated to be Manhattan experienced through Windows 8, with the erected city acting as a backdrop for the ultimate Windows hands-on experience. Sounds extreme so far, right? Hold onto your hats, it gets better. Walking into the installation Microsoft has created, one will actually be wandering through avenues and streets with visible skyscrapers above. The interactive experience boasts hundreds of devices located on rooftops within the city, customised to the neighbourhoods in which they are situated. It's a bold attempt to create an immersive experience using products. A total of twenty-five neighbourhoods will each light up with content that represents people, places and culture that make them stand apart. Microsoft intends to use Windows 8 to show attendees how it can be personalised to create a more individualised experience compared to previous versions of Windows. "Notable New Yorkers helped us curate Start Screens with the apps and websites they felt best experienced and explore the neighborhoods they call home. To see their curated Start Screens on the various devices is akin to getting an insider’s tour of the city." 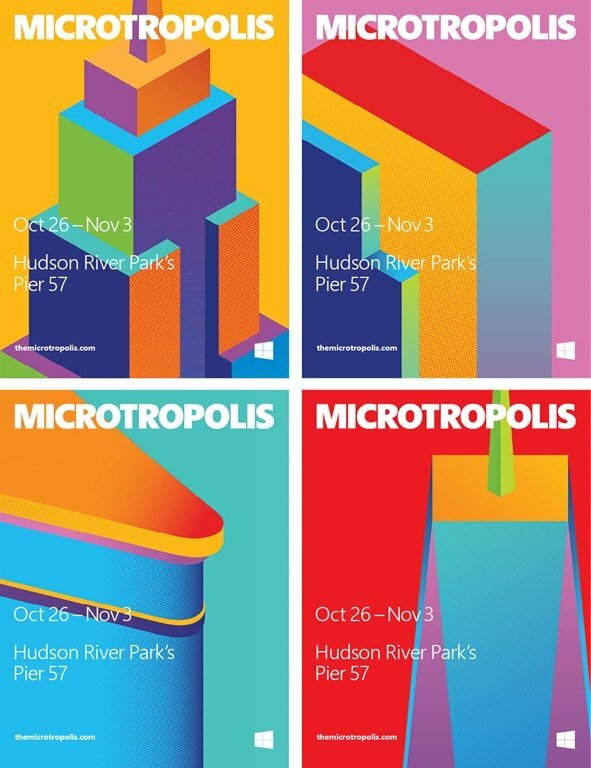 A number of individuals and institutions famed for contributions to New York will serve as curators for Microtropolis, including The Whitney Museum of American Art, Keren Craig of Marchesa, Chef Geoffrey Zakarian, the cast of Annie the Musical on Broadway and more. Should you be in New York between October 26th and November 3rd, you're welcomed by Microsoft to head on down to the event at Hudson River Park's Pier 57 to check out Windows 8, Surface tablets and a number of OEM partner products available. A number of talks and events are planned to be held, with a full calendar available over on the Windows Experience blog post. *The shop where one can purchase Surface will be open until 10pm. Be one of the first to explore and purchase Surface by visiting our store. Catch a few minutes of a favorite New York movie or settle in with some popcorn for the full feature. Xbox Video adds to the vibe of Microtropolis with famous NYC flicks projected onto the walls surrounding the city. Screening Manhattan, Muppets Take Manhattan, King Kong (1933) and Ghostbusters. No RSVP or invitation needed. Real NYC Tours take visitors on hourly tours around the stylized city, giving real information about New York as they guide people from neighbourhood to neighbourhood. No RSVP or invite needed. A day of short films and interviews with some of Vimeo’s most exciting New York directors. The best, most artistic and creative films of the city, presented by Vimeo. RSVP recommended via the Windows Facebook page on or after 10/25, but not required. There are also a number of private and RSVP events that requires one to head on over to the Windows Facebook page to reserve a spot on desired activities. As mentioned above, such events are listed over on the Windows Experience Blog. 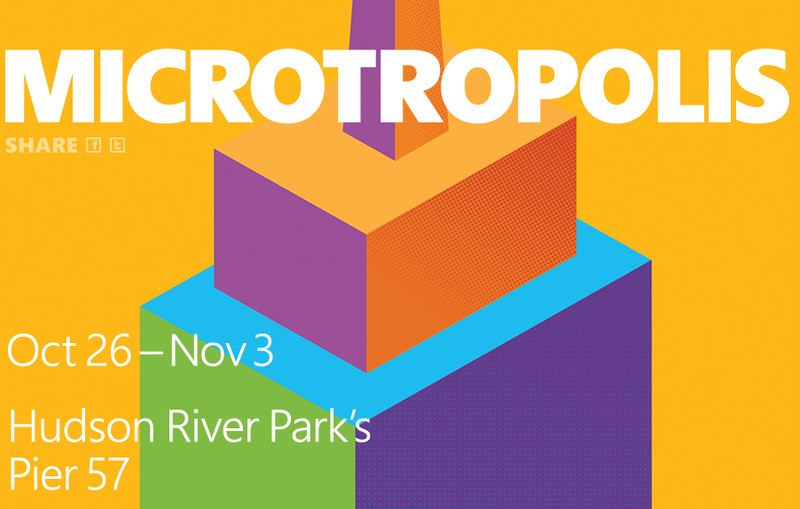 Be sure to check out and follow @Microtropolis on Twitter, read up on more details on the website or by searching through the #microtropolis hashtag.